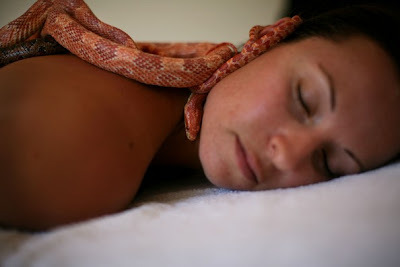 Meirav Stardinner receives a snake massage from Ada Barak at Barak's snake spa in Israel. Barack's income comes mostly from exhibiting her plants which eat everything from insects to small mammals. She discovered snakes' therapeutic value after letting people hold them after her act "Some people said that holding the snakes made them feel better, relaxed," she says. "One old lady said it was soothing, like a cold compress." Now she uses a combination of big snakes for deep massage and little ones for light massage, though all are non-venemous. The picture you are looking at (and if you're anything like me, squirming at) depicts an approximately $70 snake massage in northern Israel. That means people pay for this. 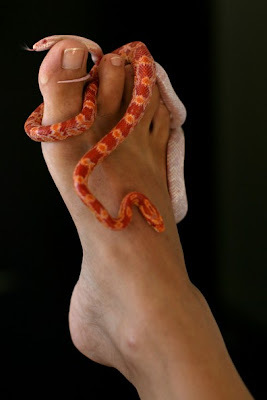 People pay to let non-venomous snakes crawl all over them. Tomer Stardinner holds snakes in his hands at Ada Barak's snake spa. Snakes crawl on Meirav Stardinner foot as she receives a snake massage from Ada Barak at Ada Barak's snake spa. 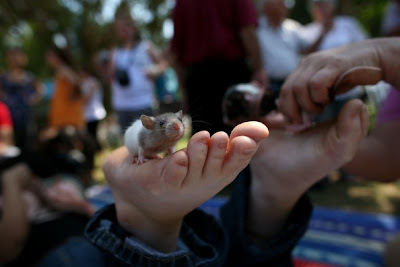 A rodent crawls on a girls foot at Ada Barak's snake spa . A boy stands in a tub as snakes crawl in it at Ada Barak's snake spa . Meirav Stardinner receives a snake massage from Ada Barak at Barak's snake spa. Massage therapist Ada Barack says she uses big snakes for deep muscle massage and small snakes for lighter massage. No word on whether or not she speaks Parseltongue, but I'd like to know how she directs these serpents to the places that need massaging and keeps them out of... warm places where they shouldn't go. I get the heebie jeebies just thinking about it. Would you pay for a snake massage? i won't even do it for free..